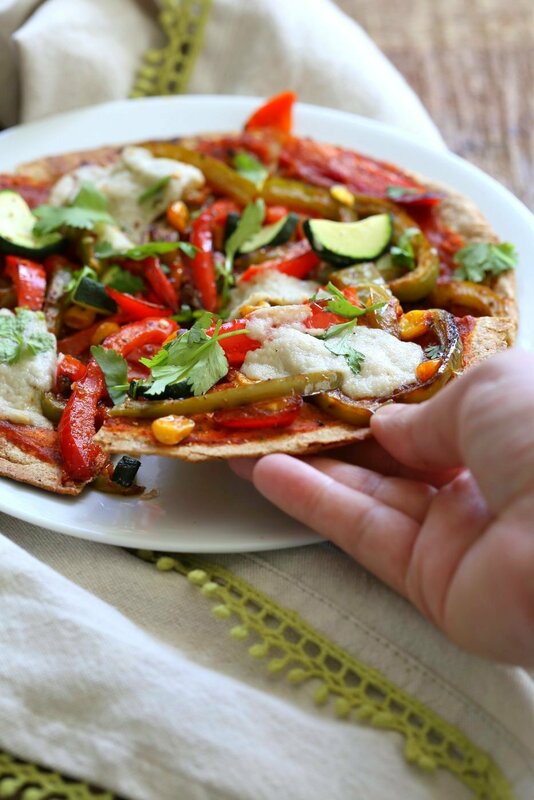 Easy Baked or Grilled Vegetable Fajitas Tortilla Pizza. 30 Minutes. Toss the peppers, corn and Veggies in smoky Fajita Seasoning to make amazing Fajita Veggies, then grill with vegan cheese. Top with salsa or other toppings. Vegan Soyfree Recipe. Easily Glutenfree. Got Veggies, Will make Fajita Tortilla pizzas! These Pizzas are super easy and a perfect light Summer meal. The veggies are cooked in a skillet then tossed with smoky Fajita seasoning. 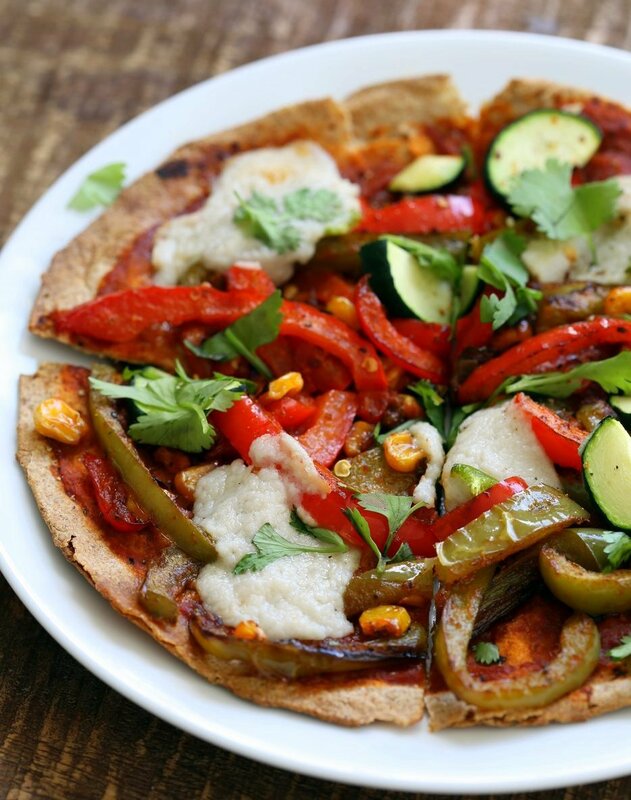 Tortillas are loaded with veggies and vegan cheese and baked or grilled to melt. Garnish with fresh herbs or pico de gallo or guacamole. The pizzas can easily be made into quesadillas. Fold and grill. Flexible, versatile and a quick Lunch or Dinner! Whenever I run out of my vegan cashew mozzarella (recipe coming in Book 2! ), I use Miyokos Mozzarella in a pinch. Both melt and taste great. Chile Lime Pinto Bean Fajita Tacos. GF This marinade is so good! Spicy Chickpea Avocado Salad Sandwich SF Must Make. 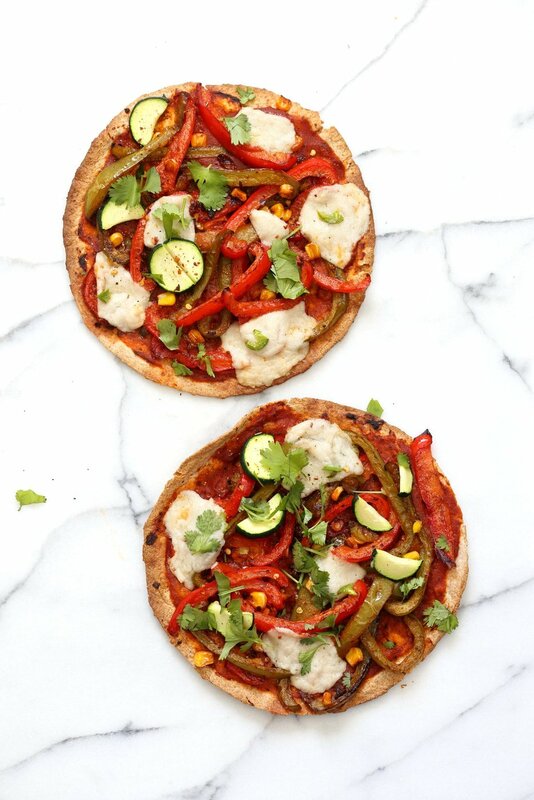 These tortilla pizzas can be soy-free, nut-free, gluten-free depending on the vegan cheese and flatbread you use. Use these Fajita Veggies in other ways to fill up tacos, burritos or wraps or add to a Fajita bowl. If you make these in any form, do let me know how they turned out in the comments! In other Stuff to think over, This video gives a gist (albeit not all sided) view of why the dairy industry became so big in the US. Interestingly, some years later, Operation flood or the White revolution added a boost to the dairy industry in India, making it the largest producer of milk and milk products in the world. And hence also the consumer, the excess production needed consumption in the early years which is why we remember ads like these growing up. 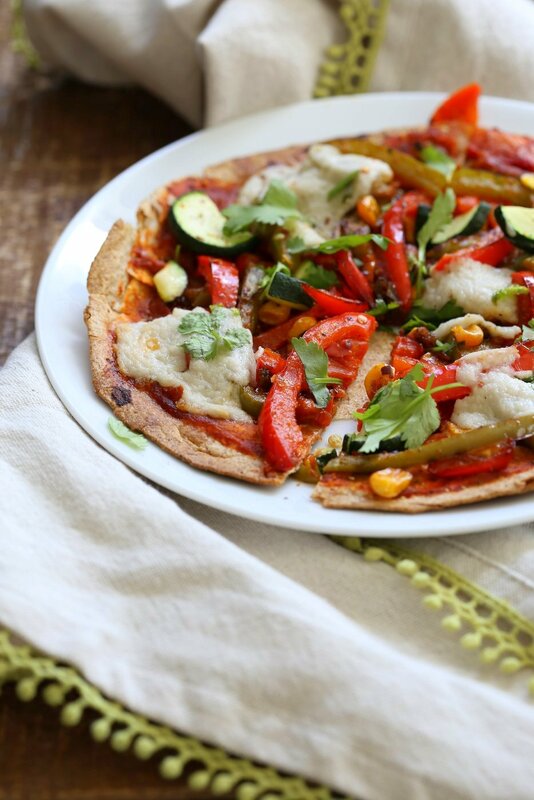 Easy Baked or Grilled Vegetable Fajitas Tortilla Pizza. 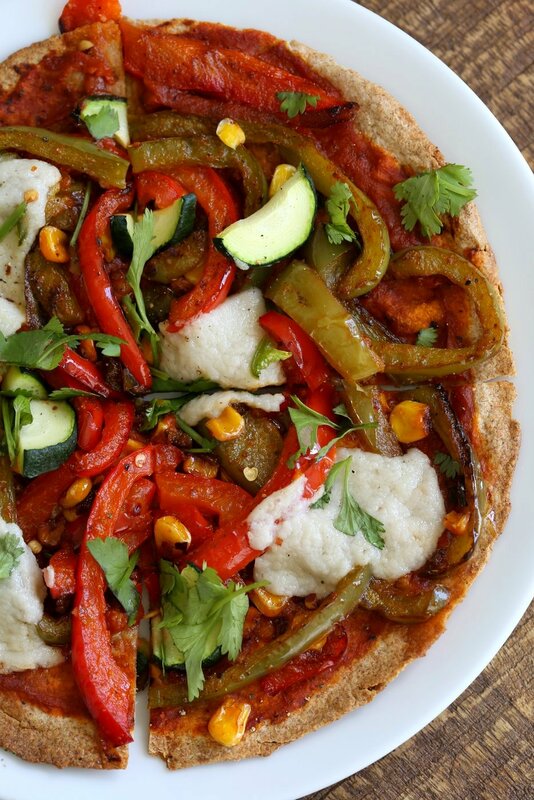 Toss the peppers, corn and veggies in smoky Fajita Seasoning, then grill with vegan cheese. Top with salsa or other toppings. Vegan Soyfree Recipe. Easily Glutenfree. 30 Minutes! Heat oil in a skillet over medium high heat. When hot, add the peppers, onion and a good pinch of salt. Cook until golden on some sides ( 4 to 6 minutes). Stir occasionally. Add the spices and mix in. Add corn, zucchini and salt. Mix and Cook for 2 to 3 minutes. At this time you can add some beans to the skillet as well. Taste and adjust spices, flavor and salt. Add more spices if adding beans or more veggies. Add a dash of lemon and mix. Spread tomato/pizza sauce or marinara on tortillas. Spread the fajita vegetable mixture from above. Add vegan cheese. Bake at 425 degrees F for 10 mins, or Grill in a covered grill to melt the cheese. Garnish with pepper flakes and basil or shredded lettuce, salsa and other toppings of choice. Make quesadillas: Spread the sauce and the veggies on half a large tortilla. Add vegan cheese, fold and grill. Make Tacos: Warm the tortilla. Fill with the fajita vegetables. Add dressing of choice like a Chile Lime dressing. Add shredded lettuce and salsa or guacamole. Variation: add mushrooms or eggplant with the peppers. The one in the pictures i think is miyokos mozzarella. My mozz looks pretty similar. 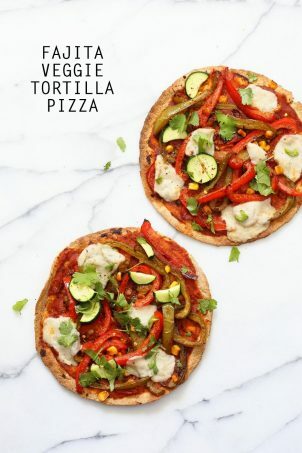 These tortilla pizzas are such an amazing idea! What kind of vegan mozzarella cheese did you use? This looks very delicious. Just a few days ago I was envying my husband eating his “regular” pizza and thought, I have to make myself a vegan pizza. Now I have an even better idea! Hi, thanks for the fab recipe I will have to try it. I can’t source Miyokos Mozzarella in UK, so I think I will try and make some instead. Re Nutritional Facts – I would really appreciate it if you could state the saturated fat content in your ‘Nutritional Facts’ box for your recipes. It would be very useful for readers like myself to know the content prior to deciding if to try the recipe. The Nutritional Facts lists his all of facts except that one, which I personally would like to know. I have mentioned it to many of my friends who I have recommended your blog and they also feel it is missing too. Here in the UK almost every monthly food magazine has that information listed next to the recipe, so we are used to being able to have the information to assess and monitor daily saturated fat intake – thanks. I am looking forward to the release of your new cook book. I already have purchased your last one through Amazon UK which I am enjoying. Hi Richa, thank you so much for replying so quickly, very much appreciated. I will look at mozzarella cream recipe also thanks for adding the saturated fat information. Finally, can you tell me does your new cook book feature a lot of coconut oil/milk/cream as I avoid all coconut products. If it does do you have alternative suggestions – Cashews etc. I am thinking of pre ordering your book but would like to know this first – thanks again. There arent many coconut recipes. It depends on the recipe and if needs a certain texture or flavor. For most recipes there are substitutes mentioned just like on the blog. With the book testing, the testers tested with many subs so there are all kinds of subs mentioned. So you can make almost all recipes in the book without a particular ingredient. Thanks again for replying so quickly and for the information regarding the coconut query. If there are substitutions with quantities you can often make recipes work, it can become a problem if something just says use cashew cream instead of coconut cream, you may not necessarily use the same amount to achieve the same result….. if you know what I mean. Best of Luck with your book release and thanks again! Yes, the quantities are mentioned since we tested the substitutions. There are also alternate sauces, for eg there is a regular white sauce that uses nuts and there is a nut-free white sauce as a separate recipe. So other recipe that use the sauce can be made with or without nuts depending on dietary needs. Marketing work going on right now till release. Lots of work but also lots of excitement! BIG thanks for answering my questions/queries. It is especially kind of you to take the ‘time out’ to answer as it is such a busy time for you right now! I was looking over your and thinking I would throw it into the mix for tomorrows dinner as I bought some candy like cherry tomatoes at the Farmer’s Market today. Then I though No! I can’t because three of my house guest are Norwegian and insist on eating pizza with a fork and knife. Luckily you threw in that tip on folding them and making quesadillas. Phew I wouldn’t have thought of that. For some reason they will eat tacos and quesadillas with their hands but refuse with sandwiches and pizza. Lol. Thank you for sharing! 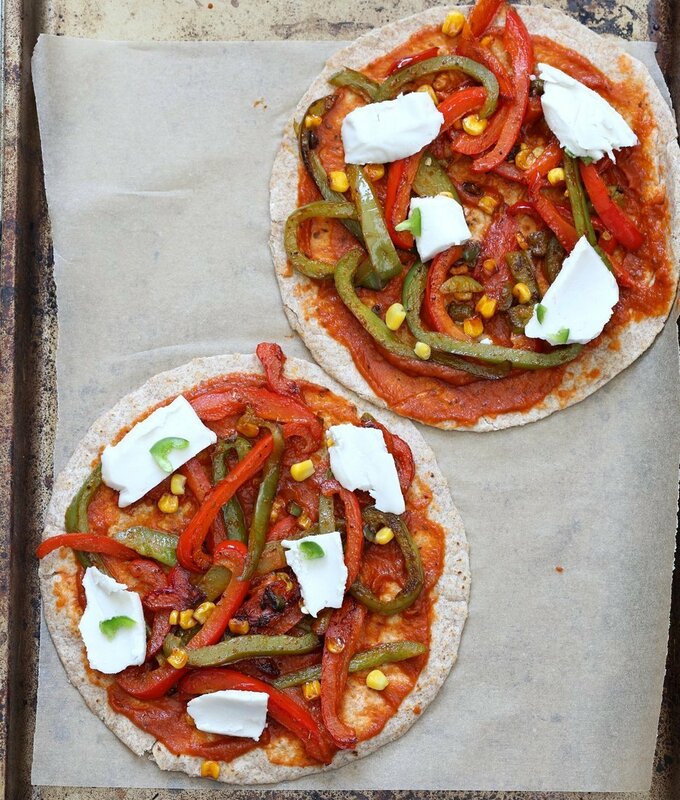 That is the great part of tortilla pizzas, you can serve it in different ways. Glad everyone liked it! Hi, I was wondering what pizza dough did you use to make these pizzas? My wife and I just became Vegan recently and she’s been really missing pizza. We did a frozen pizza from Amy’s with no cheese, but this looks far better. I am going to have to add the ingredients to the shopping list for this week. Hopefully we can score some good finds for the toppings at the farmer’s market! thank you for replying so quickly to my question. Will the mozzarella in your book that looks similar to the picture above be a “fresh” mozzarella or more of a “dryer” one that can be sliced and shredded? Looking forward to the book. You have many amazing ideas. Our family doesn’t eat dairy anymore so I am quite interested about your new cheese recipe and all your cheese recipes on your blog. Thank you for your kindness in sharing! its more fresh mozzarella for pizzas. you can make it into slices by spreading the warm mixture which will then set as slices. Not hard slices but just about workable slices that you store between parchment and use for the sandwiches. thank you for replying so fast. Wow what a great idea, especially good for packing sandwiches in a rush. The recipe looks amazing! Thank you for mentioning about dairy industria. Unfortunately the videos you linked have been removed. updated the links. thanks for letting me know!